The Continental Army, which later became the U.S. Army, was founded on June 14th, 1775. It’s leader, General George Washington, would use it to confront the British during the Revolutionary War. 240 years later, the Army remains one of America’s oldest and proudest institutions. Regardless of what your opinions are on war and peace, we are lucky to have the U.S. Army on our side. They have done what has been asked of them by their country, often times under horrific circumstances, for all these years and continues to be the backbone of America’s fighting forces. 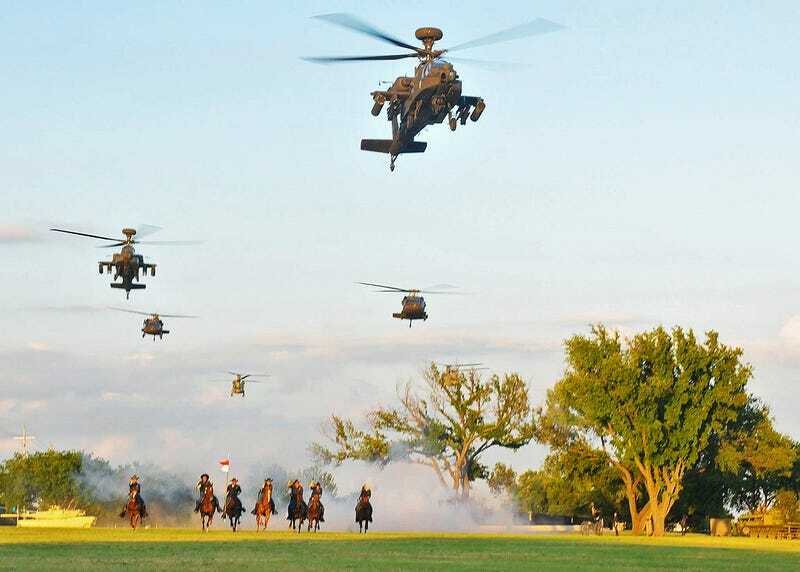 As for the incredible photo posted above, it depicts the 1st Cavalry Division performing a Cavalry charge in the air and on horseback at Fort Hood, Texas. A then and now juxtaposition if you will. The charge is a tactic that the Cavalry is well known for as it makes the enemy’s ranged weapons almost useless and is also a powerful psychological warfare tool, demoralizing and striking fear in the heart of the enemy. Regardless of morale calls and basic tactics, happy birthday U.S. Army!